Farming in the tropics comes with the double edge of extraordinary growing conditions and productivity tempered with the possibility of being hit by winds so powerful, your decades of work can be set back badly in just a few hours. This is not something you do because it is easy! On September 20, 2017, things became life-threatening for millions of people, their homes and their livelihood. Thousands died. We could not have predicted the timing of a major hurricane but we always knew it was a possibility. On September 20, 2017, much of Puerto Rico was raked by devastating winds over 140 mph at sea level, with much higher wind speeds in the mountains and rainfall measured in feet. Very little of the island was spared—and sadly, that includes our farm of 25 years. All of our people survived, and their homes largely escaped the worst—although one person lost his roof (since repaired). The days, weeks and months that have followed have shined a light on the already strained infrastructure. At first, blocked roads, no gasoline deliveries, and a lack of food in stores meant everyone had to scramble. Potable water became scarce, and people took risks just to get enough to be able to bathe and flush the toilets. Often they were forced to drink what they could find, gambling that this collected water was safe. We are writing to say that we lost about half of the trees producing fruit on the farm. High percentages of fruit trees like rambutan, durian, and mangosteen were either blown over or blown away without a trace. Some of the trees blown over might have been saved if we could have righted them but the farm was not accessible for weeks. Our people had one objective: to take care of their own needs first. This is how it should be. And since the farm is blessed with a very old cistern that has been providing potable water for a very long time, it became a critical resource for many. Any and all who could get to this cistern were welcomed to collect and carry away as much water as possible; this is what water is for—sharing. I went on-site in December of 2017 to assess whether I should continue and decided there was enough still remaining to make this work. 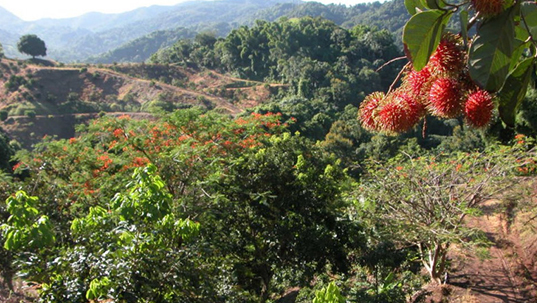 For example, over 800 mangosteen trees survived and look great. However, I am too old to take out another loan at this point in my life. But I have six wonderful hardworking people who have been with me for many years so, I made a commitment to do my best to restore and keep going but, with help. We are trying to figure out if we can continue past this year, and we're putting out a request for any individual or company interested in having us use this crew, this land, and this tropical climate to grow coffee or some other crop under contract. I first went to Puerto Rico to grow coffee, got sidetracked by commercializing tropical rare fruit and now, 25 years later, finds myself looking for outside input. If not coffee, then tell us what you are thinking. It could be cacao, medicinal plants...you tell me! Please contact us if this is something you want to discuss further. I have always been able to function without partners and now find myself trying to save six jobs and a farm in an area where there are no other jobs or much likelihood of there being any for months or even longer. The exodus away from Puerto Rico was already underway before Hurricane Maria and now is a full-blown flight. The government cannot fix something this pervasive and requires a huge capital inflow to get Puerto Rico back on a constructive track. They could not take care of the whole country or its people before Hurricane Maria, began defaulting before there was a hurricane. Now, they need massive infusions just to avoid further degradation, loss of life and loss of a way of living. There is ongoing destruction of the environment and fouling of the surrounding seas. This disaster will not go away; these Americans need help, and this is a legacy that can be recreated with pride or tainted by politicians with their failures and apathy the way it was with Hurricane Katrina. These are humans, not constituents, who need help. Panoramic Fruit Company grows commercial quantities of rambutan, mangosteen, longan, durian and achachairu. Mangosteens load up the trees every summer and are one of the best tasting fruits you will ever eat. Rambutan is the largest crop by tonnage and starts anywhere from the end of June to the middle of August. 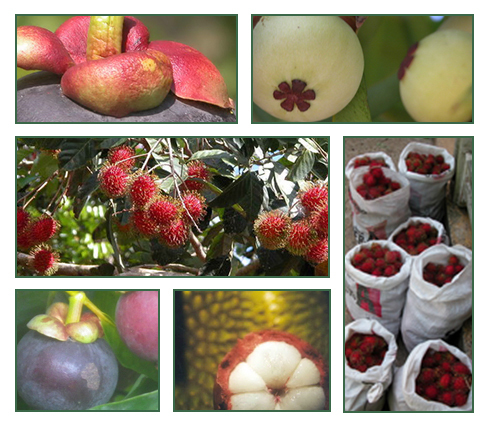 In addition, there are also smaller quantities of abiu, pulasan, Jackfruit, lemon drop, and more. 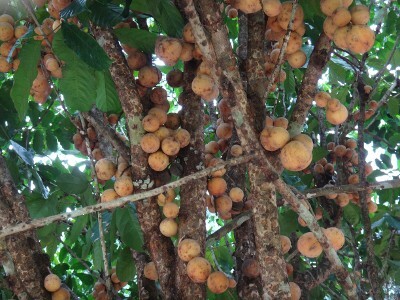 Achachairu is new to the market and is closely related to the mangosteen. Sweet and sour and spicy, a melting flesh with an easy rind to open, it has become a hit. Unique in many ways, the durian is a spiky fruit ranging in size from 4 to 20 pounds. It features a heavily sweet and fruity aroma with hints of pineapple and onion which some love and some do not, as well as a rich custardy texture with sugars and some protein. Related to canepa (but with much more to eat per fruit), longan arrives later than most of our harvest, usually appearing in September. A unique nutty and sweet flavor. This farm has over 30 different species and varieties of exotic fruits and nuts. Many will take a few more years before they first appear, and the quantities will be small for some time. 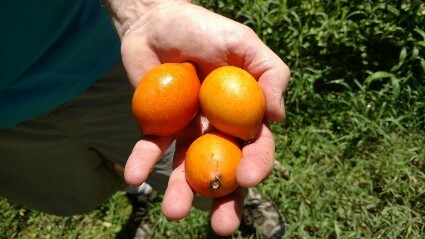 Some species were simply blown off the farm by Hurricane Maria and may not be replanted again. Just looking at possible new fruits of the future, we have fruits with names like kwai muk, pedalai, marang, chempedak and tampoi. Not your everyday treats! Pulasan is sweet, complex, and almost twice the size of a rambutan to which it is closely related. They are available during late July/ August. 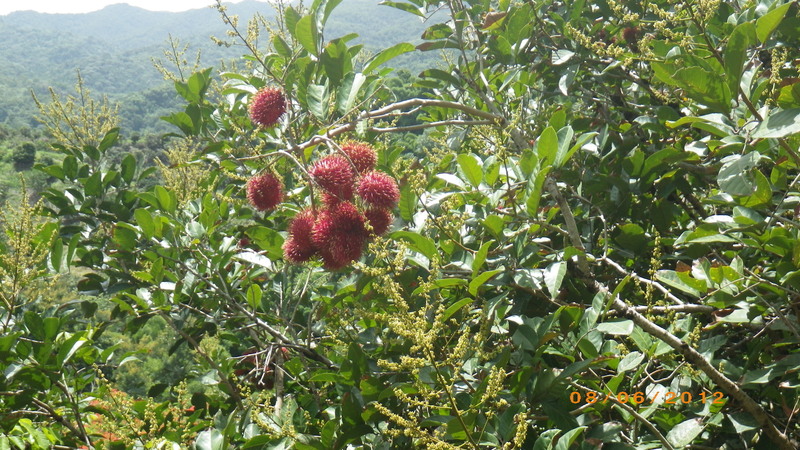 There are few fruit more delicious and complex than the pulasan and it is a tree I hope to plant a lot more of with help on my GoFundMe site. Anyone interested in seeing a video of the farm can click on the link below.